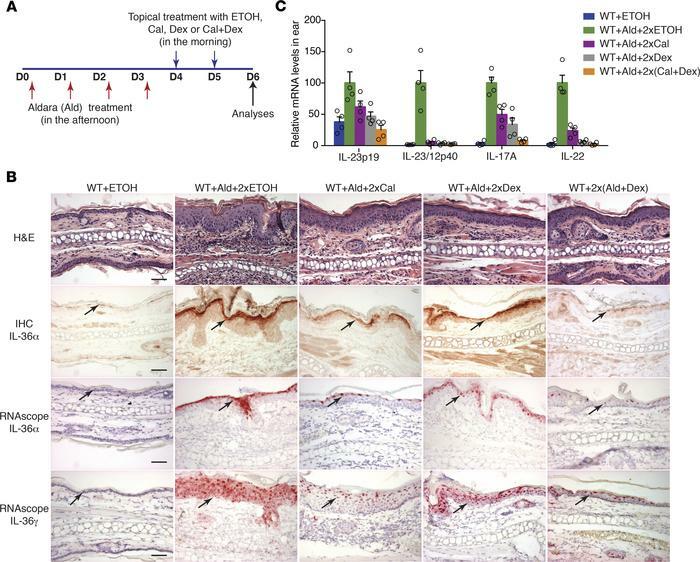 A synergy between calcipotriol and dexamethasone in repressing IL-36α/γ and IL-23/IL-17/IL-22 in the established psoriasis in mice. (A) Experimental protocol. WT Balb/c mouse ears were topically treated with Aldara (Ald) from D0 to D3 to induce psoriatic inflammation, followed by 2 times of treatment with ETOH, calcipotriol (Cal), dexamethasone (Dex), or Cal+Dex at D4 and D5. Ears were sampled for analyses at D6. (B) Skin sections were used for H&E staining, IHC staining with IL-36α antibody, and RNAscope in situ hybridization with probes for IL-36α or IL-36γ. Arrows point to positive signals. Scale bar: 50 μm. (C) qPCR analyses of the treated skin. Values are mean ± SEM. Data are representative of 3 independent experiments with similar results.